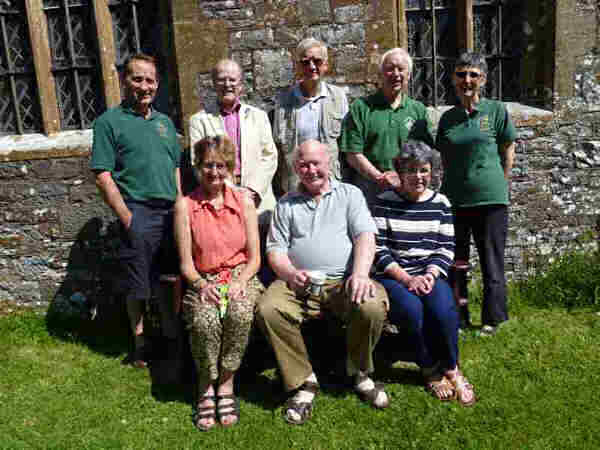 It has been 10 years since the Troyte Ringing Centre was set up in Bampton and Huntsham towers. Mike Hatchett has undoubtedly been the inspiration and leading light throughout this time and once again he came to the fore on 27th September. His was the idea that we should host a dinner for all those involved in the Centre over the years. We enjoyed an excellent meal provided by Acer Catering and guests were also given a commemorative booklet outlining the development of the TRC from the start to the present day. The journey that the Ringing Centre has made started in 2001 when the North East Branch applied for a grant from Awards For All to locate a practice bell within the branch. 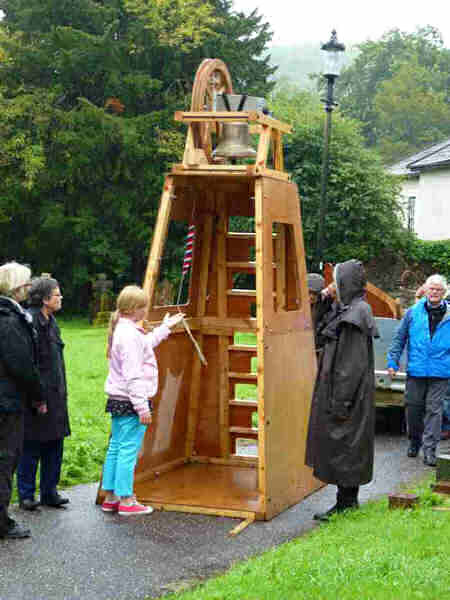 After a lot of hard work and organisation a 1616 redundant bell from Dorset was installed above the ring of 6 in Bampton. Computer, simulator and other equipment followed to provide a silent practice facility. As the Practice Bell project was being completed another challenge took the eye of Mike Hatchett. The bells at Huntsham had become increasingly difficult to ring, the treble and tenor were unringable and the bells were in danger of falling further into disrepair. £65,000 was raised over three years to restore the bells, with the work completed in 2004. The bulk of this was done by Mike & Pat Hatchett, Lynda & Ken Smith with Neil Thomas (Whitechapel Bell Foundry). Richard Newman made the new wheels and other volunteers gave their time when possible to support the project. Other work included restoring the tower roof and floors, re-locating the clock mechanism, installing electric power and lighting and installing sound control, as well as remodelling and re-hanging six of the original bells and installing 2 new bells in a galvanised frame. It was at this stage that the two towers were combined to make the Troyte Ringing Centre. You can read more about the TRC, its events, peals and development and history by going to: www.troyteringingcentre.org.uk. Currently we run about a dozen training events a year and host quarter peals, peals and branch practices. But Mike was not content with this mammoth achievement. He followed this up with organising the design and creation of a set of display boards about ringing. These are often seen around Devon and beyond being used by towers and other organisations for PR and recruitment days. Following on from this we have acquired our own demonstration bell - see September 2014 RRD. No wonder, then, that the Centre won the Founders Prize for the best ringing centre in 2007. As with all organisations the TRC is continuing to develop. Les Boyce is now the Manager of the Centre with Mike taking a back seat (difficult to imagine!). Both towers are constantly busy, with Huntsham available for use almost anytime for peals, quarters, wedding and celebration rings. From the excess income raised each year we contribute to the DCBRF, local charity groups and to Bampton and Huntsham PCCs. One thing was obvious at the 10 Year Anniversary celebration that none of this would have been possible without the principal hosts for the evening, for which we are all extremely grateful. Thank you, Mike. The First Outing for the Troyte Ringing Centre band was held on 21st September 2014. 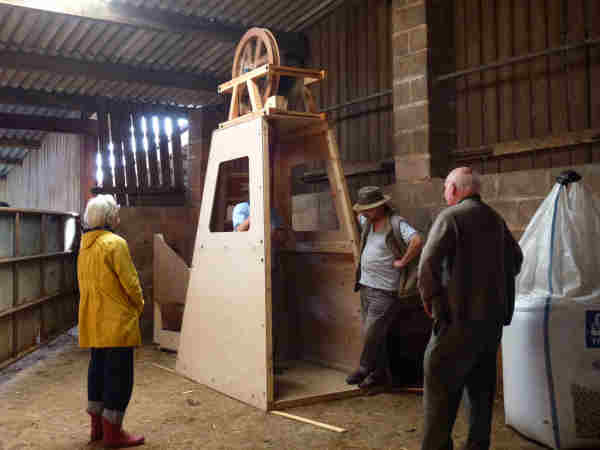 Using the Exmoor Community bus we travelled from Dulverton, Bampton & Huntsham to visit our new demonstration bell at Morrell's Farm, (the temporary location at Chris Bolt's Farm). After some of those present had tried out the bell we travelled to Stoodleigh where we were greeted by Jennifer. We rang creditable call changes and doubles' methods. 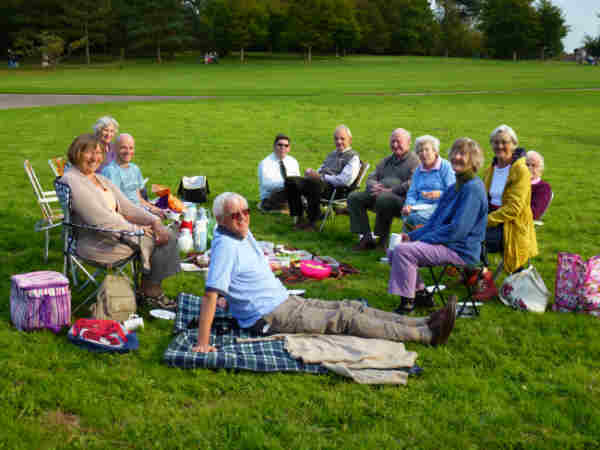 We then travelled to Knightshayes Court for the highlight of the Outing, Our Bring & Share Picnic. TRC Ringers know how to Picnic. The sun shone as we settled on the top of the Parkland. By now any of the visitors to the House and grounds were leaving. The end to a perfect day. Teddy Parachuting for Bampton Open Day has been an annual event for 13 years now. This year, armed with our new Demonstration Bell, we hoped to combine the parachuting with a recruitment drive. Unfortunately someone had other ideas and the weather was against us. Undeterred we assembled the bell in the morning and the bellringers were all ready by 2pm to begin launching teddies. 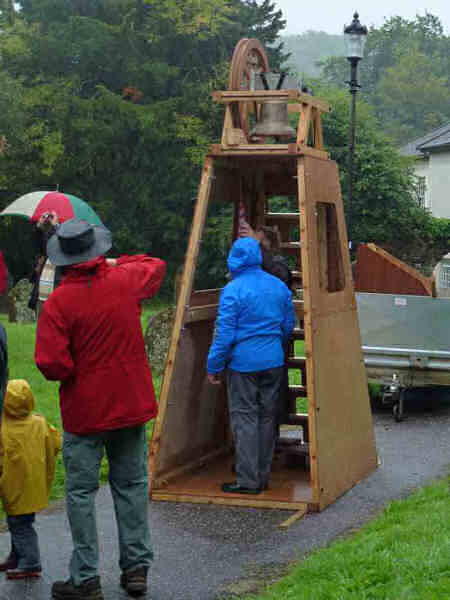 As the rain eased we assembled a small group of enthusiasts clutching small bears and eventually launched 40 from the top of the tower to the usual 'Ooohs' and 'Ahhs'. The Demonstration bell kept a few children entertained whilst waiting to see their little friends fly through the air. Towards the end of the allotted time the sun began to shine. Well at least it was dry to dis-assemble the bell. In the meantime it's back to the drawing board for recruitment ideas. 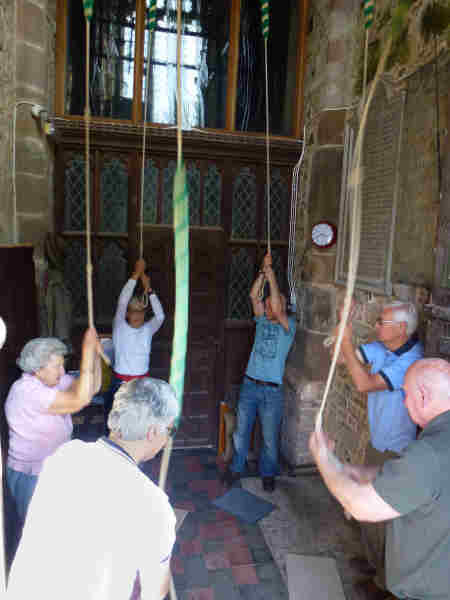 To celebrate the 140th anniversary of the Guild of Devonshire Ringers the NE Branch asked the Guild to support them in ringing 140 bells for the AGM Festival day which was hosted in Tiverton. As members of the Troyte Ringing Centre and home of the first president of the Guild of Devonshire Ringers we decided that we would attempt our first Quarter Peal on all 8 bells with only local ringers. With three covering bells our attempt to ring 1260 of Plain Bob Doubles was successful! The first Quarter Peal at Huntsham for a TRC band in the 21st Century. We were delighted with our achievement. Rung as part of the Guild Festival "140 bells for 140 years" celebrating the founding of the Guild of Devonshire Ringers in 1874.